File photo The Fairborn Area Chamber of Commerce is hosting its annual banquet awards. The upcoming event is slated to begin 5:30 p.m. Friday, April 19 at the Holiday Inn Dayton/Fairborn, 2800 Presidential Dr., and will include a social hour with cash bar, dinner and an awards ceremony beginning at 6:30. FAIRBORN — Fairborn’s finest individuals and businesses will be honored at the Fairborn Area Chamber of Commerce Annual Banquet. The upcoming event is slated to begin 5:30 p.m. Friday, April 19 at the Holiday Inn Dayton/Fairborn, 2800 Presidential Dr., and will include a social hour with cash bar, dinner and an awards ceremony beginning at 6:30. ”The annual event will highlight the chamber’s activities and success of this past year as well as honor individuals and businesses in the Fairborn community,” Fairborn Area Chamber of Commerce Director Matt Owen said in a press release about the event. Honorees will be receive awards by presenters including the Greene County Career Center, City of Fairborn, Wright State University, Wright Patterson Air Force Base, Fairborn Rotary Club and Fairborn Lions Club. The Fairborn Area Chamber of Commerce will also present the Chamber’s Ambassador of the Year and the Chamber’s Presidents Award. Owen will additionally be honoring outgoing board member and past president Eric Murray of MoneyWise for his service on the chamber board of directors. Brian Lampton of the Lampton Agency will take over as board president and the chamber will honor outgoing board president Jayme Bettinger with Wright-Patt Credit Union. Ace Handyman, celebrating 80 years of business; and Foy’s Variety and Halloween Stores, celebrating 90 years of business, will each be honored with the John Dalton Legacy Awards. “The major highlight of the evening will be the presentation of the Jack Huelsman Civic Award named in memory of a former businessman who unselfishly demonstrated his dedication and generosity to the Fairborn community while being a leading member of the chamber,” Owen said in the press release. Attendees can choose to dine on either herb crusted beef roast, chicken cordon bleu, grilled Atlantic salmon or a vegetarian meal of farro with roasted mushrooms and spinach. The meal includes grilled mix vegetables, smashed potatoes, market garden salad and a family-style dessert. To RSVP, contact the Fairborn Area Chamber of Commerce by calling 937-878-3191. Tickets are $45 each if registered by April 10, or $55 thereafter. A table of 10 is $425. 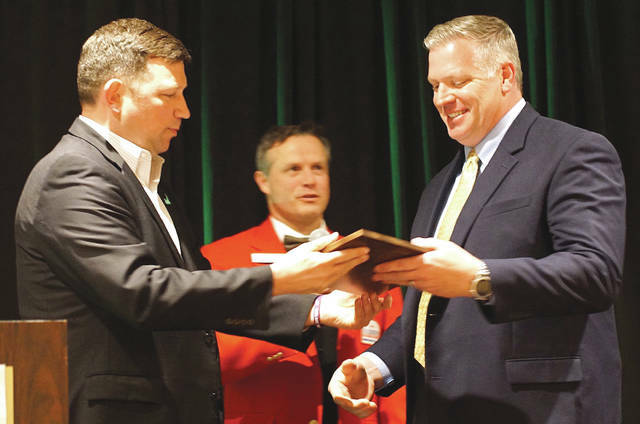 https://www.fairborndailyherald.com/wp-content/uploads/sites/50/2019/04/web1_chamberawards3.jpgFile photo The Fairborn Area Chamber of Commerce is hosting its annual banquet awards. The upcoming event is slated to begin 5:30 p.m. Friday, April 19 at the Holiday Inn Dayton/Fairborn, 2800 Presidential Dr., and will include a social hour with cash bar, dinner and an awards ceremony beginning at 6:30.